Under the Andalusian Sun food, wine and travel blog: ¡ Viva el Kräftskiva ! 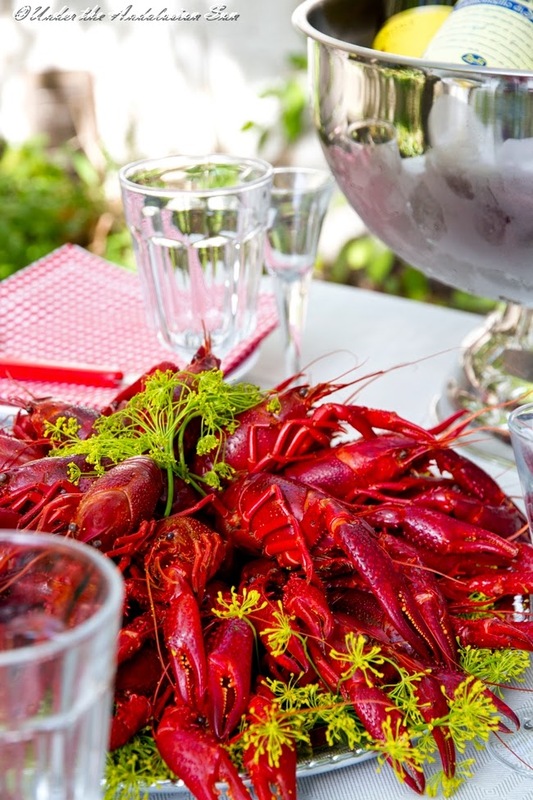 Though crayfish, cooked in its dilly broth is the bona fide star of the kräftskiva table, you've got to have something else to feed your diners too. Like the Mediterranean potato salad. But sure enough the crayfish craziness wasn't satisfied with just the plate heaving with them - we just had to have some more. Moderation, you see, is something you might have noticed isn't exactly my forte. Less is never more and too much is only rarely enough. And though all that fiddling with the shells is a lovely activity in itself I wanted to give our guests a little easier access to the succulent treats. 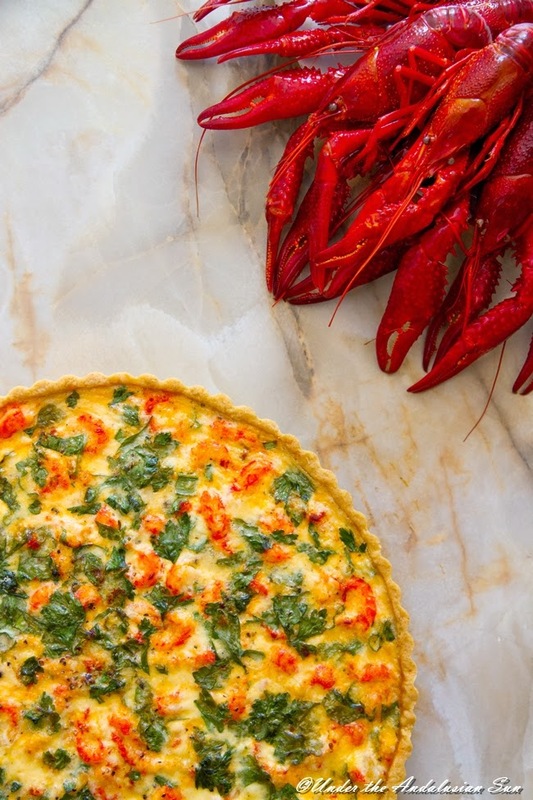 So, in celebration of this blog's roots and the Mediterranean theme of our this year's kräftskiva I baked a tart which got a lovely Iberian kick from chorizo and pimenton. And the secret behind the sunny colour of the crust? Spanish saffron! Because ¿por que pas? You all probably know the pie crust by heart by now, non? You'll find it in here, in here and in here, too. I dissolved a pinch of saffron threads (appr. 2 g) into the liquid that goes into the crust. Prepare the crust and blind bake at 200º, first 15 minutes covered with foil and baking beans/ regular dried beans/ rice and then without he foil for another 10 minutes or so. Let cool while you prepare the filling. Combine lemon zest, pimentón, coriander seeds and garlic powder. Drain crayfish tails , squeeze dry and toss in the spice mixture. Finely slice chorizo and chop the spring onions. Spoon the filling into the cooled pastry case: first spring onion, then chorizo, then corn, then crayfish tails and finally parsley leaves. Or, how ever you prefer. Top with custard and bake at 175º for 30-40 minutes until set and golden brown. Let cool and serve. Whisk thoroughly and pour over the filling before baking. PS. 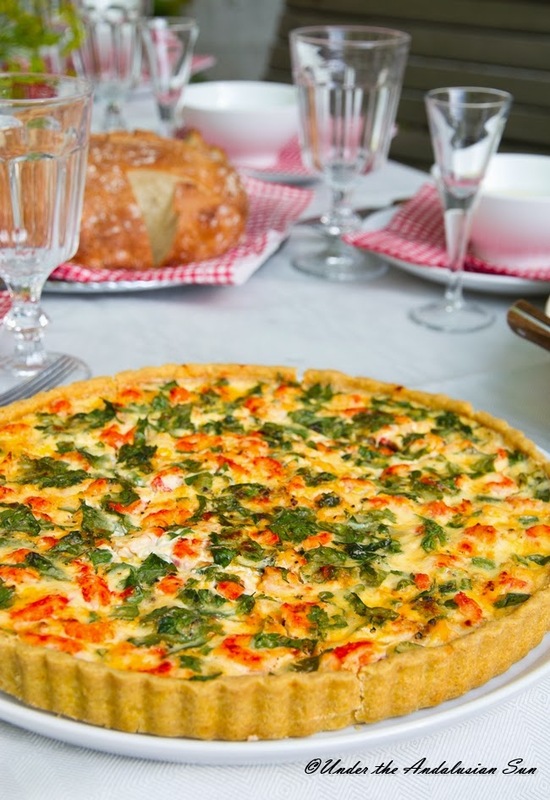 For even easier to manage recipe for an oil-based crust that I recently used for the tomato, basil and ricotta tart please click yourself here!